I'd like to point out that Captain America #7 is my pick of the week. Screw you to Matt who doesn't like the great artwork on this book by John Romita Jr. See, that's the problem with kids. They don't appreciate nothing. Eh, kids. What are you gonna do about them? This issue continues with Captain America still being stuck in Dimension Z. (No relation to World War Z.) Cap runs around the giant fortress that Zola has hold up in. Captain America wants his son Ian (That he saved from Zola back in issue #1.) Ian is being brainwashed by Zola to make him into a bad guy. So tying a person up and tapping his or her eyes up and making them watch A Clockwork Orange can make you evil. Who knew? They fight and she brings up how Cap could have killed her but didn't. That Captain America is a stand up guy, but you already knew that, Didn't you? Cap saves a friendly mutate that helped him waaayyy back in the beginning in this story and leaves himself open to attack from Jett. She relents after seeing Captain America with his shirt off and saves his life and turns good. OR maybe it was his strong moral character or something. The fortress that is home to Zola starts to shake and move ( but not in a dancing way.) and lifts off the ground. The fortress heads back to earth to infect everyone and make the planet one big ZOLA!!!! Jett gives Captain America the details of Zolas plan and agrees to lend a hand, but only if he agrees to give Ian a totally normal life. I mean, i guess the only normal life you can have by growing up in the Marvel U. The issue ends with Cap finding Ian and learning that gasp, he's now evil. Hey, Stanley Kubrick films will do that to you. Great storyline so far. 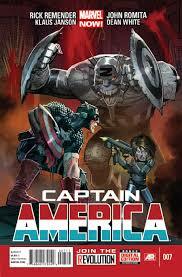 Rick Remender is killing it, so long as he doesn't kill Cap. Also, great job on the art by the legendary JRJR. Scott Hanna's inks make it look even bolder and boxy-er. That's not a word but hell, I'll use it. Top notch stuff.